I was tagged by Bibi @ Bibi’s Book Blog (like 4 months ago, whoops! better late than never!) and you guys should totally check out her blog and give her a follow! 1 – How many books is too many in a series? Ummm it depends on how obsessed with the series I am. I think anything more than 10 is pretty daunting for starting a new series but doesn’t mean I won’t do it. 2 – How do you feel about cliffhangers? Well if it’s a series I kind of expect it. I can deal with cliffhangers better when I’m not waiting for the next book to come out in a year and can binge an already released series. Cliffhangers in a stand alone book are cruel and should not exist. 3 – Hardback or Paperback? Probably hardback cause it’ll less easily damaged but I’m not that picky really. I never understand how anyone can pick just one book. I love sooooo many! 5 – Least favorite book? Does this mean a book I still liked but that I liked it least or does it mean a book I hate the most??? Cause if it’s the former I have no idea. If it’s the latter I also don’t know. 6 – Love Triangles, yes or no? Yes. I don’t care what anyone says. I’m not like, all about love triangles but I think there is a time and place for them and they can be done well. 7 – The most recent book you couldn’t finish? Blood Crescent by Stevie McCoy -the writing style was just not for me at all. 8 – A book you are currently reading? I’m working my way through the Throne of Glass series for the first time right now. 9 – The last book you recommended to someone? I have no idea. I haven’t been super active in the community recently and basically no one in my real life wants to listen to me talk about books or my recommendations. 10 – The oldest book you’ve read? Probably a Tolkien or a Jane Austen book. 11- The newest book you’ve read? Magic Triumphs by Ilona Andrews, it was released in August 2018.
howhowhowhowhowhowhowhowhowhow can people have one single favorite author?! 13 – Buying books or borrowing books? Buying!! I’m a book hoarder, I like to collect and have them available whenever I want and never have to give them back. 14 – A book you dislike that everyone seems to love? I don’t read many books I end up disliking but I hated how the Divergent series ended, how the 5th Wave series ended, and I hated Beautiful Disaster. 15 – Bookmarks or ear marks? Neither! I always remember what page I’m on or log it in Goodreads, or it just pops up to last read page on my Kindle. 16 – A book you can always re-read? Harry Potter. Georgia Nicolson. ACOTAR. Night Huntress. These are series but still counts. 17 – Can you read while listening to music? Yep. Sometimes it bothers me but usually I’m more bothered by not having some kind of background noise. 18 – One POV or multiple POVs? One POV. I’m not against all multiple POVs but often it can get pretty exhausting for me to read. 19 – Do you read a book in one sitting or over multiple days? Both. But if I’m reading over multiple days it’s usually because life is getting in the way of me reading and not because I want to drag it out. 20 – A book you’ve read because of the cover? I can’t think of any one book specifically. 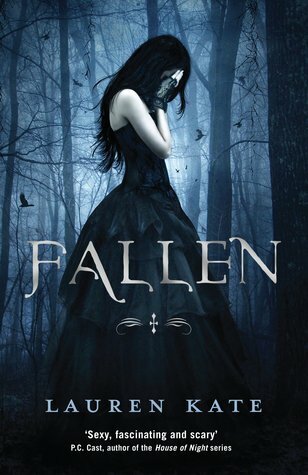 Maybe Fallen by Lauren Kate cause I used to be a real sucker for those kinds of covers in my teens. I’m not tagging anyone specifically because I feel like I’ve been doing so many tag posts recently but if you’re reading this, YOU’RE TAGGED! So feel free to do this tag if you’re feeling up to it! Great post! I’m interested to see what you think of the ToG books! It’s true tho. I keep saying my fave author is Stephen King, but from other genres i have other favourites.